The belief, held by the overwhelming majority of Jewish Britons, that the UK media’s coverage of Israel fuels antisemitism, is largely based on the manner in which headlines, text and imagery in reports on Palestinian casualties imputes Israeli guilt (and malevolence) by failing to provide balance and relevant context. A March 27th Guardian article by Mairav Zonszein (a contributor for the far-left web magazine +972) represents a prime example of this consistent journalistic failure. In addition to the misleading headline, the accompanying text provides almost no background on the circumstances surrounding the more than 2,000 Palestinian fatalities. Israel killed more Palestinian civilians in 2014 than in any other year since the occupation of the West Bank and Gaza Strip began in 1967, a UN report has said. Israel’s activities in the Gaza Strip, West Bank and East Jerusalem resulted in the deaths of 2,314 Palestinians and 17,125 injuries, compared with 39 deaths and 3,964 injuries in 2013, according to the annual report (pdf) by the UN Office for the Co-ordination of Humanitarian Affairs (OCHA). The conflict in Gaza in July and August was largely responsible for the dramatic increase in fatalities. It claimed the lives of 2,220 Gazans, of whom 1,492 were civilians, 605 militants and 123 unverified. More than 11,000 people were injured and about 500,000 Palestinians were internally displaced at the height of the conflict. About 100,000 remain so. First, the OCHA document linked to in the article acknowledges that their figures were based on information from the (Hamas-run) Gaza Health Ministry – casualty numbers, especially regarding the percentage of civilians killed, which have been refuted by multiple sources. A report published by the Jerusalem Center Public Affairs by Lenny Ben-David cited an ongoing analysis of the summer war casualties, by a respected Israeli research center, contradicting the Hamas statistics. On December 1, 2014, the Meir Amit Intelligence and Terrorism Information Center reported on its detailed, name-by-name analysis of 1,598 Palestinian fatalities in Operation Protective Edge that amounted to 75 percent of those who were killed. Of the fatalities who could be identified, about 45 percent were non-combatants, while 55 percent were combatants – nowhere near the levels of civilian losses that were discussed in the media. Additionally, Zonszein fails to even speculate on the number of Palestinians killed by the hundreds of misfired terrorist rockets which fell within Gaza. Moreover, Guardian readers are not told that if Hamas accepted the Egyptian-proposed ceasefire on July 15th, as Israel did, the number of Palestinians killed would have been around 200, 90% less than the total by the end of the war on Aug. 27th. Further, Zonszein somehow managed to make reference to the summer war in Gaza without noting the continuous rocket attacks which triggered the conflict. In the three weeks leading up to the start of Operation Protective Edge on July 8th, terrorists in Gaza fired 250 rockets at Israeli communities. Tellingly, the word “Hamas” does not appear anywhere in Zonszein’s article. During the entire fifty day war, more than 4,000 rockets and mortar rounds were fired at Israel from Gaza. And, as even anti-Israel NGOs have acknowledged, rockets used by Palestinian terrorists are unguided projectiles which “are inherently indiscriminate”, and therefore “prohibited under international law”. Thus, their use “constitutes a war crime”. In short, Palestinians in Gaza committed thousands of individual war crimes in launching rockets which could have killed thousands of Israeli non-combatants in 2014. We of course don’t ever expect to see a Guardian headline titled ‘Palestinian terrorists attempted to kill thousands of Israeli civilians in 2014’, because, as former AP correspondent Matt Friedman argued, the media operate under the assumption that the only party that matters in covering the conflict is Israel, and thus Palestinians can only exist as passive victims of Israeli aggression. I am sure that this is the beginning of a long and informative series in which numbers are the only criterion and in which context is carefully avoided. In fact I would like to see detailed lists including name, age, profession and manner of death of the Afghanis involved,kept by the UK or by some UK NGOs to parallel those that the IDF and the Meir Amit Intelligence & Terrorism Centre have kept in their zeal for some moral control of that most immoral of human activities, war. Hope that Mairav is up to the task. I would be surprised if she was. She seems very superficial to me. She is just a common-or-garden as-a-Jew waste of space, with no brains to speak of. You may be interested in this website http://markhumphrys.com/israel.html that clearly shows in diagrams the relatively small scale of casualties incurred by the IDF compared to rest of world conflicts, yet Israel is the sole country that is constantly accused of ‘disproportionate’ violence and war crimes. Mark Humphrys is such an amazing supporter of Israel that it is worth spending hours reading through his site. I think you mean ‘inflicted’, not ‘incurred’. Honestly, I still do not understand nor do I belIeve I’ll ever accept this “disproportionate” crap! Why would I want to equalize my Military casualty numbers to that of my enemy? My goal if I can’t reach my strategic objectives would be to maximize the enemies losses and injured while minimizing my own. Another huge disparity in this thinking is if I’m from a country of 7mm people confronting a country of 80mm people although casualty number at first may look disproportionate however if you compare loses to percentage of population size it may not necessarily be so. I believe I’ll stick with my maximum/minimum theorem. Can someone shed light on this that makes any sense. Easy. It is merely another pile of crap from Jew-haters with which to demonise Israel for refusing to commit suicide. I saw an interesting number yesterday. Since 2001, there have been 19,000 missiles shot at Israel. 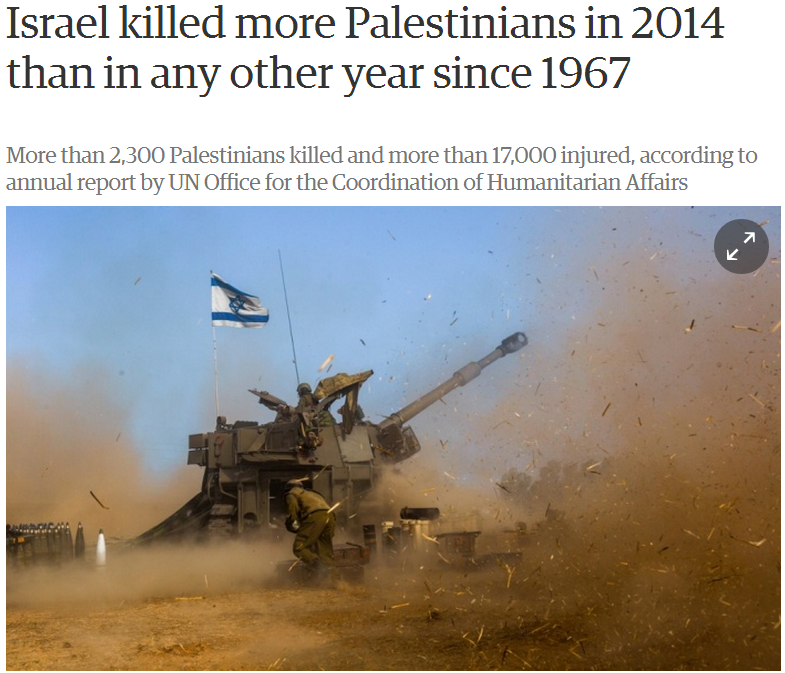 Somehow, I don’t believe that 2300 people die in 2014 if there aren’t 19,000 missiles shot since Israel’s offer of peace to the Palestinians was shot down (get it?) without a counter-proposal. Israel bashers really are the stupidest people on this planet. It’s the picture and videos, by far, that’s forming and hardening public opinion against us. Second I believe the “all knowing” Anchor reporting the Hamas news conference Talking Points as facts without seeking and reporting the full IDF Spokespersons response. They never challenge what’s said to them be y the terrors Hamas but nearly point an accusatory finger at the IDF Spokesperson when interrogated by them and become Snide as if they are at best half believing it. Hamas is taken on trust. With Israel, it’s always ‘Israel says’ (or indeed, ‘claims’). And then they act all surprised and hurt when accused of antisemitism. Meanwhile, the stomach-turningly ghastly Alibhai-Brown writed in Der Independent that ‘Israel is worse than Hamas’. After about 19,000 war crimes in targeting Israeli civilians, patience ran out and botty spanking ensued. People like “Zonszein” who write this highly dishonest, distorted and vicious kind of slander are the worst category–pathetic self-hating Jews so insecure in their identity that they must demonstrate to a Christian audience how much they can abuse democratic courageous human-rights observing Israel. Zonszein and his ilk are worthy only of our disgust and contempt. I certainly hope his family is proud of him and what he’s done. Why Great Britain has forgotten what was life under fire by the nazi V1 and V2? Why the mass media sympathize with the followers of nazi propaganda, Hamas, Islamic Djihad and PLO brigades who regularly fire at civil areas in Israel from civil areas?